Many people think that bad breath is merely an inconvenience and something that's socially unacceptable. While both of those hold true, bad breath can actually be a major warning sign of a serious dental health issue or general health issue. The team at our Albuquerque cosmetic dentistry center would like to take a moment right now to look at some of the basics concerning bad breath, what its causes are, and how it can best be treated by skilled dental care professionals. The most common cause of bad breath is the bacteria that is naturally found in the mouth. This bacteria causes both tooth decay and gum disease to occur. In addition, bad breath can be caused by issues with the sinuses, infections of the tonsils, respiratory conditions, and health problems related to the digestive tract. When you meet with a cosmetic dentist in Albuquerque, you will be thoroughly examined in order to account for various causes of bad breath. The best treatment for bad breath is related to the root cause of the bad breath. Once the exact cause or causes have been identified, we can then determine the kind of treatment that is just right for you. Below are just some possibilities that may be considered. 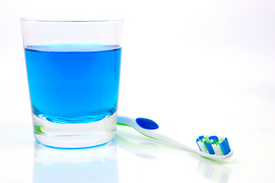 Since tooth decay and bad breath are often related, treating the tooth decay is a great treatment option to consider. For minor tooth decay, the best option is traditional fillings. For more serious tooth decay, inlays, onlays, or Albuquerque dental crowns would be a better option to consider. For bad breath caused by gum disease, it's important to get the infection under control first through periodontal therapy and gum treatment. Once the infection is successfully treated, we will then work on restoring the condition and appearance of the gumline. One of the easiest things that you can do to eliminate gum disease is to brush your teeth at least twice a day and floss every night. Removing food particles from the teeth means less chance for the bacteria in the mouth to create malodorous smells. In addition, we recommend that patients use a tongue scraper to remove food particles that may be caught on the tongue. Going in for general dental care twice a year is an ideal way to make sure you have a health smile that looks great as well. We can monitor you for possible dental problems and address them in a timely fashion. When restorative dentistry isn't the answer, medical treatments may be required, particularly in cases where the bad breath is a symptom of another condition. If you would like more information about the causes of bad breath and the many different options for treatment, be sure to contact our Albuquerque cosmetic today. By getting in touch with us as soon as possible, we will be able to figure out a dental care solution or help you get the underlying systemic issue addressed as soon as possible.